NCDV win Law Society award. The best legal professionals gathered at the Hilton Hotel Park Lane for the annual Law Society Excellence Awards. The awards recognise extraordinary firms and individuals across England and Wales in areas such as pro bono, marketing and communications, diversity, client service, business, and human rights. There were nine winners in the firms categories and seven winners in the individual categories. The keynote speech was given by Baroness Helena Kennedy QC, and BBC journalist Mishal Husain hosted the ceremony. President of the Law Society Jonathan Smithers said: ‘The Law Society Excellence Awards are a celebration of the outstanding work our members do. We are immensely proud of the profession, its commitment to innovation, to first-rate client service, to business, equality, human rights, and of course to upholding the rule of law. NCDV was winner of the Excellence in Client Service category. 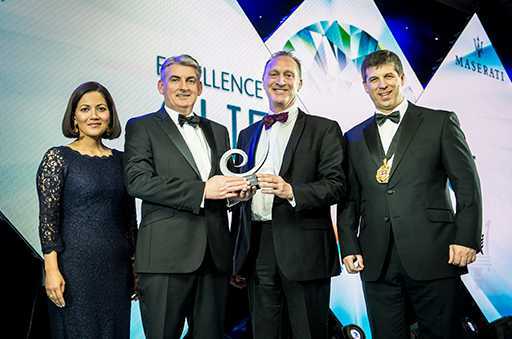 Collecting the award was Mark Groves Head of Operations at NCDV seen here with BBC presenter Mishal Husain, award sponsor Martin Best CEO Document Direct and the Law Society President Jonathan Smithers.